South Korea's Yonhap news agency says U.S. Secretary of State Mike Pompeo is likely to meet with his North Korean counterpart in the United States next week. Pompeo told VOA contributor Greta Van Susteren in an interview on Oct. 19 that he hoped the meeting would take place "in the next week and a half or so." Yonhap reported Monday that a South Korean diplomatic source with knowledge of U.S.-North Korea negotiations said, "At the time of Secretary Pompeo's remarks, [the meeting] was being planned for the end of October, but I understand that it was delayed by a couple days due to circumstances on the U.S. side." "The location will probably be the U.S. East Coast," the source said. Pompeo has met d uring previous talks with Kim Yong Chol, vice chairman of North Korea's ruling Workers' Party Central Committee. However, the Nikkei Asian Review is reporting that North Korean leader Kim Jong Un's sister Kim Yo Jong could also join the talks. Kim Yo Jong is said to have a close relationship with her brother. 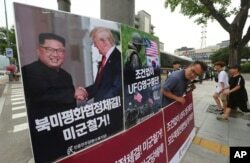 FILE - A photo showing U.S. President Donald Trump and North Korean leader Kim Jong Un is displayed as a member of the People's Democratic Party stands to oppose military exercises between the United States and South Korea near the U.S. embassy in Seoul, S outh Korea, June 19, 2018. Pompeo told VOA this month that a date for that summit has not yet been set, but said Trump is "committed" to it. "We're working on finding dates and times and places that will work for each of the two leaders," he said. The two countries have suspended several military exercises since an unprecedented June summit between Trump and Kim in Singapore, where Trump announced the U.S. would stop what he called "provocative" and "expensive" "war games" with South Korea. He said the move w as as an act of good faith and in response to North Korea's commitment to denuclearization, and its continued suspension of nuclear and missile tests.